Metrodata's BC2x00 family of Baseband Converters allow the latest generation of Serial Link and Bulk Encryption Devices using the EIA530 interface to be connected to HSSI satcoms equipment, routers and radio systems. By utilizing Metrodata's BC2x00 Baseband Converters, it is possible to utilize a mixture of new and existing/legacy equipment. Typically used to interface Cisco HSSI Routers to EIA530 Cryptos, or EIA530 Cryptos to HSSI Satcom Modems or HSSI Radio Relay Systems, the BC2x00 baseband converter family presents a major step in solving interoperability and interfacing issues within Defence networking. 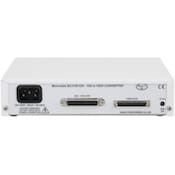 The BC2000 enables the connection of an EIA530 router port to a HSSI encrypter, satellite modem, or microwave radio system, whereas the BC2100 enables the connection of a HSSI router port to an EIA530 encrypter, satellite modem, or microwave radio system. The product range consists of two devices: the BC2100 which connects EIA530 equipment to a HSSI DTE (e.g. a router), and the BC2000 which connects EIA530 equipment to a HSSI DCE (e.g. a satellite modem). With a maximum speed of 20Mbps the BC2x00 family of Baseband Converters supports the maximum rate supported by EIA530 equipment. Both the BC2000 and BC2100 support control signal level conversion and pass through. This application shows a BC2000 connecting an EIA530 router card to a HSSI satellite modem. The BC2000 presents a HSSI DTE interface to the satellite modem, thereby operating at the clock rates specified by the satellite modem. The BC2000 presents an EIA530 DCE interface to the routers, thereby passing on the satellite modem clocks on to the router to tell the router what speed to operate at. This application shows a BC2100 connecting a HSSI router card to an EIA530 satellite modem. The BC2100 presents an EIA530 DTE interface to the satellite modem, thereby operating at the clock rates specified by the satellite modem. The BC2100 presents a HSSI DCE interface to the routers, thereby passing on the satellite modem clocks on to the router to tell the router what speed to operate at. This application shows a BC2000 connecting an EIA530 router card to a HSSI crypto, and a BC2100 connecting the HSSI crypto to an EIA530 satellite modem. This application shows a BC2100 connecting a HSSI router card to an EIA530 crypto, and a BC2000 connecting the EIA530 crypto to a HSSI satellite modem.